Iguanastamp | C'mon Iguana Stamp! Hello and welcome to the Stamp Review blog hop. It’s been awhile since I hopped with this talented group of demonstrators. I’m so happy to be joining in this hop. I’m the end of the line this time, so if you’re hopping in order, you just came from Cindy Elam’s Heart’s Delight blog. She has a distinctive style I just love. This week we’re featuring the This Little Piggy stamp set. I fell in love with this set when it came out in the catalog this past June. I was so glad for this hop and the chance to get inky with it. My first card is a tri-shutter card. You can find a tutorial for it here. Tri-shutter cards have that real wow factor, but they’re really quite simple to make. The paper is from the Delightful Daisy dsp pack. I did a little creative inking and masking to get the sentiments and piggies to look like I wanted. I like that they’re poking out beyond the white card stock. I stamped each pig twice, cutting the second image out and sponging it with Powder Pink. Then I glued the colored image on the stamped background image, letting the pigs overlap the side of the paper. When I was going through my stamps to get my piggies, I came across another set that gave me a fun idea for a second card. Remember the old Mystery Date game? Sometimes you opened the door and a handsome guy was waiting on the other side. This just cracks me up. 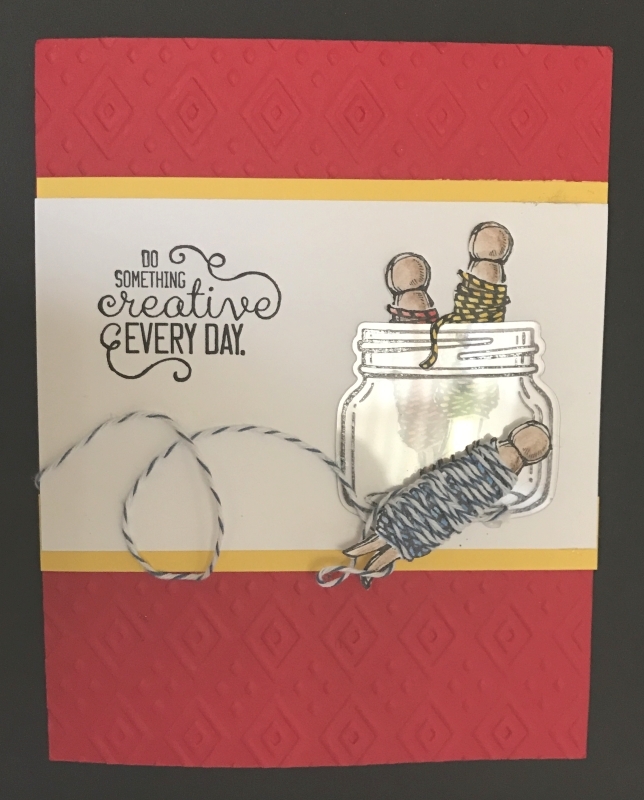 I used the stamps and framelits from the At Home With You bundle. I love that the framelits include a rectangle that cuts the door out so you can open it up. I just love this piggy set and I hope you like my cards. Now it’s time to hop on to Rochelle Blok’s blog – The Stampin Blok – to see what she has in store for you. Thanks for stopping by! 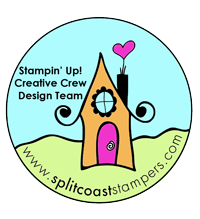 This past April, I attended the Stampin’ Up On Stage event in Savannah. I had such a great time! Two of my downline, Carol and Vera, attended with me. And my parents and husband came along and we made a long weekend family trip of it. So much fun! The cherry on the top was that I was selected to be one of six display stampers at the event. 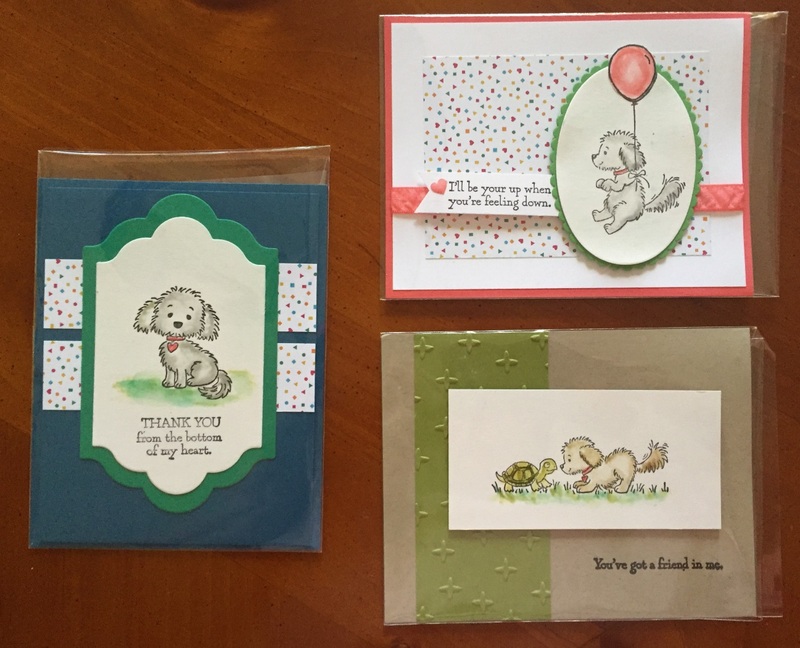 A couple of months before the event, Stampin’ Up sent me a box of goodies – stamps, papers, and embellishments from the upcoming annual catalog. One of the first things I used was the lemon punch – no matching stamp set, so I really had to use my imagination to come up something. The paper is from the retired Fruit Stand designer series paper (was current at the time). 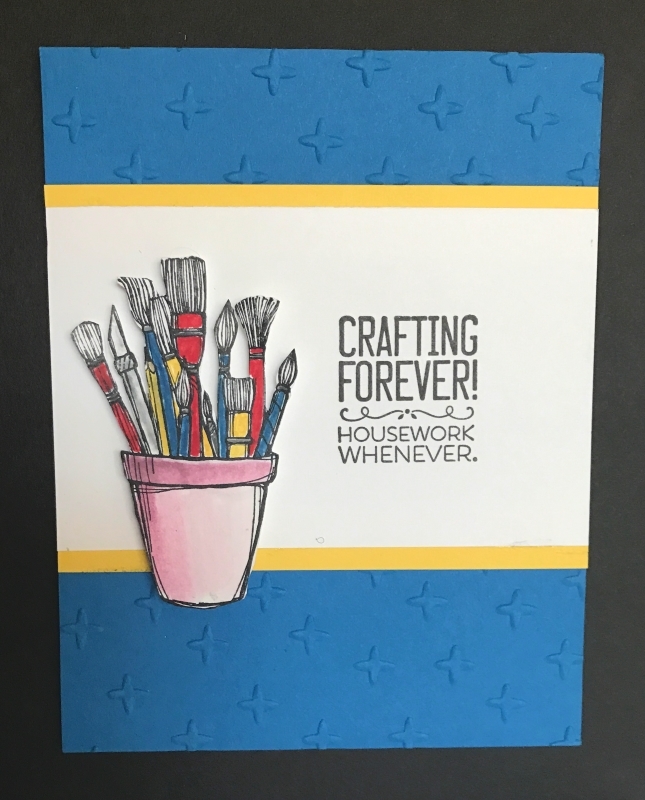 The colors and fun design was perfect for the card I created with the punch. Next up was a “framed” design I created using the new Color Theory designer paper for the background. This was so much fun to make. I love the paint chip look of the paper. I shaped and sponged each of the lemons and leaves that I cut out with the punch to give them a cool 3D shape. The flowers are made with the now retired Petite Petals punch, with one of the centers from the Botanical Blossom Builder framelits. I now have the stamp set that goes with this punch and I’ve made some cute cards with it, but this framed art remains my favorite so far. I’ll be back soon (I promise) with more of the cards I made for the On Stage event. Thanks for stopping by! Happy New Year! It’s been awhile since I last posted. I’m hoping to do better in 2017. 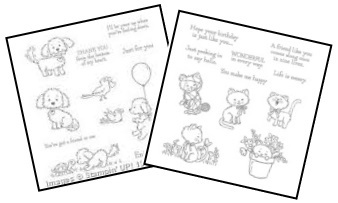 I’m kicking the year off with a post about one of my favorite stamp sets from the new Occasions catalog – Beautiful You! This set is especially great for water coloring using the new water color pencils (also in the catalog). But in our class tonight, we did a different kind of “water coloring”. We used one of the larger acrylic blocks and applied three colors of ink to it.Using a Stampin’ Up spritzer, we sprtized the block 5-6 times and waited a minute for the colors to blend. Then we “stamped” water color paper with the acrylic block. Use water color paper or Shimmery White card stock. These stand up to water better than regular cardstock. And you’re going to use a lot of water. I found that using the new foam ink pads worked better than the old linen pads. I also read you can use the Stampin’ Write markers, but that didn’t work out well for me. In addition to spritzing the block after inking it up, I also spritzed the paper. This helped to move and blend the colors. I placed the paper on top of the Stampin’ Up paper piercing foam sheet for a little more give. Take time to press the block firmly on the paper, moving your finger over the block in order to get all the colors transferred to the paper. Here’s a closer look at the green card. We used Bermuda Bay, Marina Mist and Wild Wisabi. I thought the image was a little light so I took a chance and re-stamped it. I was a little off, but I kind of like it – it adds to the blurry look of the card. We also made this version with Crushed Curry, Tangerine Tango and Sweet Sugarplum. This was the first card I made and the colors didn’t blend quite as much as the green card. I really like these colors together, though. The fun thing about this technique is that no too backgrounds end up the same. Which is your favorite? My poor blog – It has languished all summer while I was crazy busy doing other things, including 3 car trips to Alabama in a month and a half. Now my youngest is at Marion Military Institute starting his first year in college. Life has settled down, at least a little, so maybe I’ll have a little more time to devote to my blog. I had to write today because I’m so excited about my newest class – Pick Your Pet. It’s based on two adorable sets in the main catalog – Bella and Friends and Pretty Kitty. 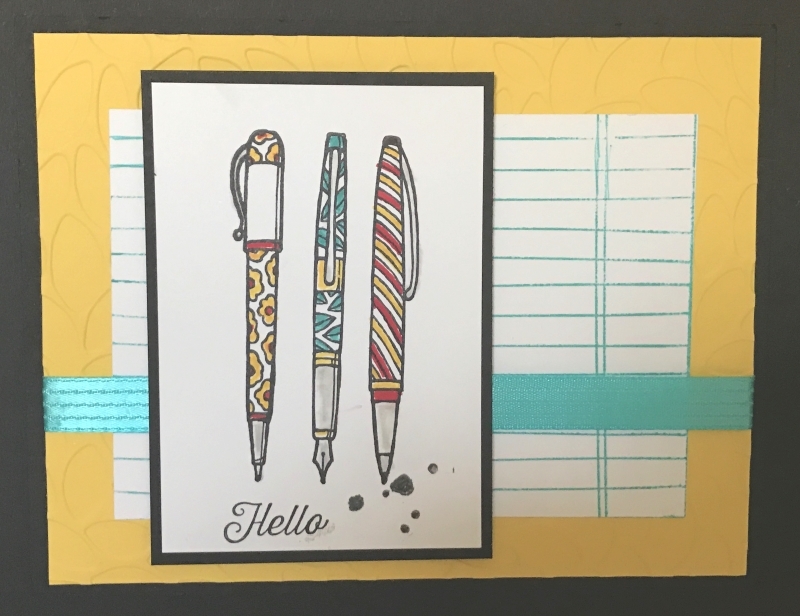 This is a product-based class where you choose from one of the stamp sets and get the set, instructions, and supplies to make three cute cards. I’m more of a cat-lover, but this little guy is so cute. There are so many possibilities with this stamp set. 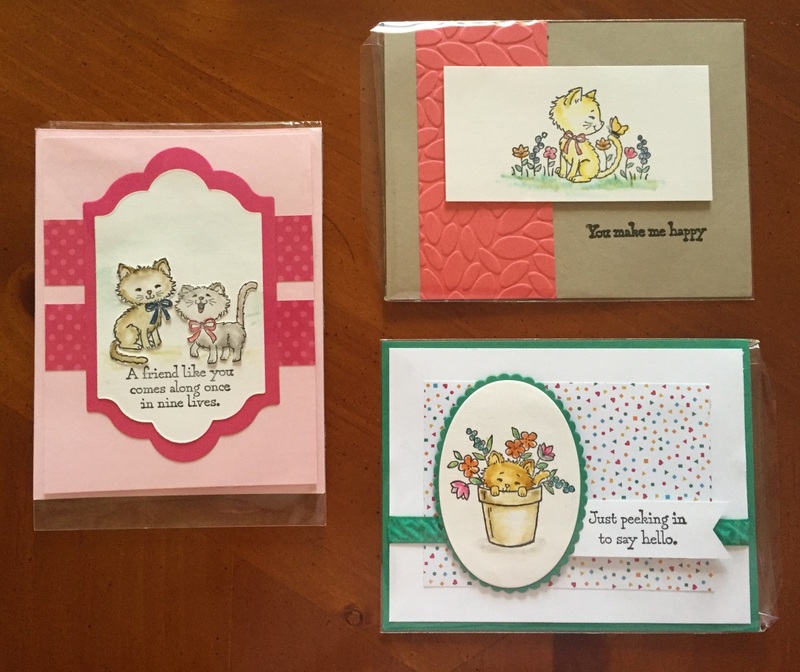 I used the same card layouts to create the Pretty Kitty cards. Aren’t they sweet? 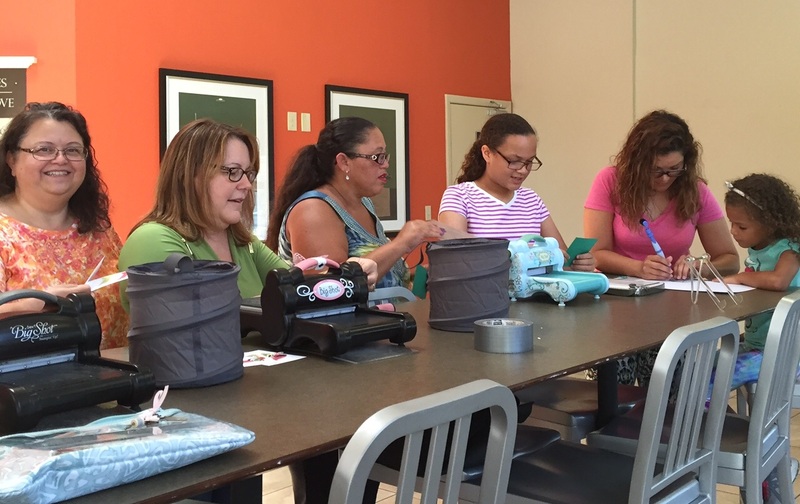 The class was last Saturday and it was very well received. It was so successful in fact, I’m offering it as a Class to Go. Are you interested? The cost is $30 (plus shipping). Deadline to order is September 15. Be sure to specify which stamp set you want. It’s such a fun set and has matching framelits (love that!). The Festive designer series paper is also fun and full of bright colors like the papers in these cards. For this card, I cased a gift bag in the catalog. There are so many great ideas in the catalog – you don’t have to recreate them exactly (although you can). Just use them as a starting point for your own creations. I used some of the designer series paper to add a guitar to the card above. Like the embossing on the Pumpkin Pie paper? It’s the Festive embossing folder designed to go with this stamp set. And one last one – another llama. This one sports a neck tie and a jaunty sombrero (cut from the dsp). I hope these give you some ideas for this stamp set, because I think you need it! Yesterday we held our first Stamp Camp. I was joined by my two good friends and downline, Vera and Carol. 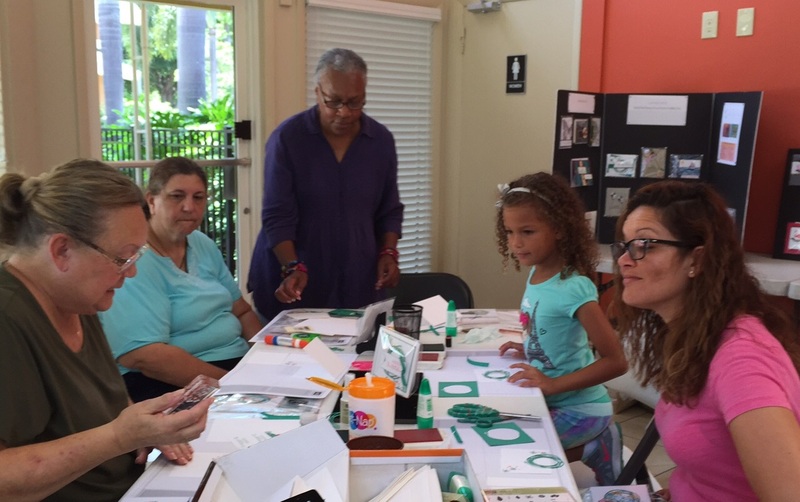 We had 3 tables set up and each participant made two cards at each table. We also had lots of card samples displayed, gave out catalogs, and at the end, we had cake for Vera’s birthday. 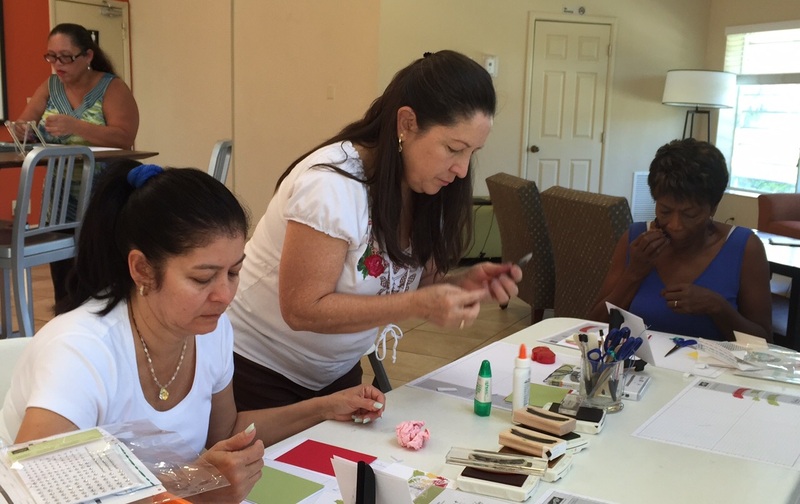 Fifteen ladies joined us for an afternoon of making birthday cards. Lining up at the Big Shot table. Busy creating at Carol’s table. We’re using the llama set at my table. Hard at work at Vera’s table. We got very positive feedback from everyone who came. Did you miss out? 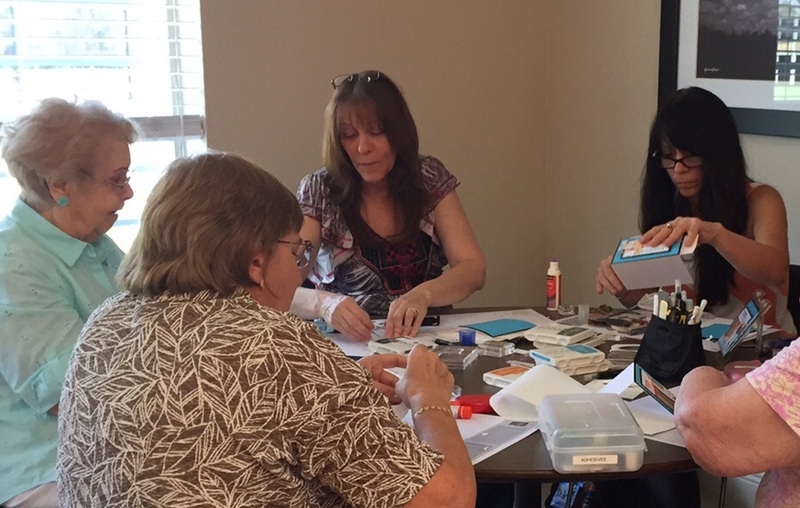 We’ll be doing it again at our Christmas in July Stamp Camp next month. Hope to see you there!